On Friday 30 November 2018, Hope House commemorated the 2018 World AIDS day under the theme “live positively – Know your status”. The speeches reminded us where we are coming from and how much has been achieved. We remembered the suffering, the tears, the struggle to keep our hope alive, the funerals we attended. We pray daily to God, asking Him to keep us strong but also to help us stop so much suffering. God listened to our prayers. Though there is still no cure for Aids, it is no longer a death sentence. STATEMENT BY NERCHA EXECUTIVE DIRECTOR DURING THE 2018 WORLD AIDS DAY COMMEMORATION HELD AT HOPE HOUSE – CARlTAS MANZINI ON THE 1ST DECEMBER 2018. Programme Director allow me hide under your wing and observe all protocol you have recognised. I greet you all this morning. Today, as friends and associates we are gathered here at Hope House to commemorate the 2018 World AIDS Day under the theme “live positively- Know your Status”. Under this theme, we seek to redirect the focus to revitalise the benefits of knowing your HIV status, the importance of accessing relevant HIV services and taking individual action to empower yourself on your HIV status. Knowledge is power! The theme will further mobilise everyone to overcome fear caused by stigma and discrimination as we, together, create a revitalised and reinvigorated movement on testing during the year. Additionally, to test and know your HIV status will contribute to sustaining the achievements made by the country over the years and intensify efforts towards the national goal of ending AIDS as a public health threat by 2022. In prevention, the country has surpassed the target of halving new infections by 2018. The Swaziland Incidence Measurement Study of 2017 reported that new infections had reduced from 2.5% in 2011 to 1.4% in 2017 showing a reduction of 44% over the five-year period. We appreciate the role played by all stakeholders. Whilst the achievement is impressive, I must admit that it was not easy. Further the road ahead for the prevention response is going to be harder. It is only programmes like the ones implemented by the church that will make meaningful contribution in that you go into the deep of communities and you are able to touch the lives of people at the household level. This action, which we term “demand creation” is what will make the difference in the response to ensure that people are brought to health facilities to access services. Please continue the good work it is well recognised. The country has further launched a new National Strategic framework on HIV and AIDS 2018-2023 which is the blue print to guide the implementation of the “last mile” in the HIV and AIDS response. It is the road map for achieving the national goal of Ending AIDS by 2022. The target in treatment has been upscale from 90:90:90 to 95:95:95, ensuring that 95% of people living with HIV are tested and 95% of those tested are enrolled onto treatment and 95% of those on treatment are virally suppressed. 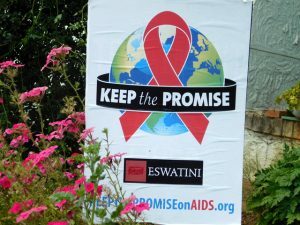 Nothing less will lead to ending AIDS. Government supported by all her partners has delivered effective and decentralised services which has seen most people who need treatment accessing life-saving ARV’s. I am particularly grateful for the service that Hope House is providing for Emaswati. You are helping the sick to be restored back to life. Surely you have demonstrated the love of Jesus Christ, whose goal was to seek the lost, and to heal the sick and wounded. What stands out the most, is the love, passion and dedication with which you conduct the business. People come to the Hope House and are healed in the heart before they are healed in the body. This is valuable for even those that have defaulted in taking their ARV’s treatment as they are encouraged and are restored back to health. For that I wish to say thank you. You are truly a fountain of life for the nation. I further note with heartfelt gratitude the Church is further in communities supporting food security and livelihoods interventions, psycho social and counselling services amongst others including the delivery of these services through incorporating of the rights- based approach in programming, which ensures that services are delivered as part of the basic right to health. These interventions are delivered in support of the broader social sectors whose mandate is alleviating the social impact of HIV and AIDS on vulnerable and hard to reach populations. As I end, Programme Director, allow me to finally enlist continued collaboration with the church and confirm that this partnership has made significant dent in the country’s response to HIV and AIDS. Together let’s commit to ending AIDS. I Thank You .